Leave it to the expert, Ronen Bergman, to point out what is staring us in the face. The attack in Lebanon came on the anniversary of the end of the Second Lebanon war. It was clearly planned, and clearly intended to send a message. As to what the President or Prime Minister of Lebanon want, that is irrelevant. Lebanon is run from Tehran and Damascus. On Tuesday afternoon, several hours before a highly anticipated televised speech by Hezbollah leader Hassan Nasrallah, Lebanese army snipers fired at an Israeli military detail that was trimming trees on the Israeli side of the border. The premeditated attack, which killed a colonel and left another officer severely wounded, came exactly four years since the end of the war between Israel and Hezbollah in Lebanon. The question now is whether this incident could spark a chain reaction that results in another war. Despite its overwhelming military might, Israel emerged badly bruised from its confrontation with the Shiite militia in 2006. Since then, the Jewish state has repeatedly threatened that any act of aggression on the Israel-Lebanon border would be met with a punishing response. It claimed it would hold the Lebanese government—in which Hezbollah is a key player—responsible, regardless of the identity of the perpetrators. 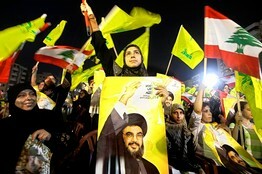 A Hezbollah supporter holds a poster of Hezbollah leader Hassan Nasrallah during a rally marking the fourth anniversary of the 2006 Israel-Hezbollah war, Tuesday, Aug. 3. The initial reaction of senior Israeli military figures to the sniper attack was to urge Prime Minister Benjamin Netanyahu and Defense Minister Ehud Barak to implement contingency plans to bomb Lebanese Army camps, Hezbollah strongholds and Beirut's power stations. But rapid diplomatic intervention by the United States and France prevented a resounding military response by Israel, which could have led to a wider conflagration. Instead, Israel opted for a small-scale response which killed two Lebanese soldiers and a journalist who had been invited ahead of time by the Lebanese army to witness the sniper attack. Sources in the Israeli intelligence community and in UNIFIL (the U.N. peacekeeping force at the border) that I spoke to yesterday believe that the incident was instigated by a Lebanese Army brigade commander who is a Shiite and Hezbollah supporter. Whether or not he acted with the knowledge of his superiors, top Lebanese brass backed him after the fact. The Lebanese government is in a bind. Prime Minister Saad al-Hariri, son of the assassinated former prime minister, detests Hezbollah and would like nothing better than to see his father's killers brought to justice. But Hezbollah is a key partner in his government, and is effectively able to veto any action he might take. The prime minister is also aware of the widespread support that Hezbollah enjoys among Shiites and Sunnis, and he is careful to avoid being seen as too closely aligned with the West. His control over the predominantly Shiite Lebanese Army is limited at best, particularly in the south of the country. The more interesting question is whether the brigade commander at the border received prior approval from Hezbollah's political chain of command. It's hard to believe that the highly symbolic timing of the incident was coincidental. It was also convenient for another reason: The report of the international inquiry into the 2005 assassination of Lebanese Prime Minister Rafik al-Hariri is expected to be published in a matter of days or weeks. It is widely believed that the U.N. panel, composed of Lebanese and international lawyers and judges, will indict senior Hezbollah officials. As far as Nasrallah is concerned, a limited flare-up between Israel and regular Lebanese forces without his direct involvement would help divert domestic attention away from the indictments. Syrian President Bashar Assad is also concerned about the panel's report, since an initial investigation, released by the U.N. Security Council in October 2005, implicated his country. Syria, readers will remember, withdrew its forces from Lebanon following Hariri's assassination. Yet it remains intimately involved in that country's affairs through its intelligence agents and the large bribes it doles out to Lebanese politicians. To the extent that the panel's final report is hostile to its interests, Syria might benefit from an Israeli-Lebanese border conflict, or even a limited renewal of civil war violence inside Lebanon itself. Intensification of almost any type of hostilities would enable Syria to further strengthen its hold on Lebanon. Both Nasrallah in his Tuesday speech and Mr. Assad, who also gave a speech last week, threatened that the entire region would erupt in flames if indictments are issued against them. These are not empty threats: Conflicts within Lebanon have an unfortunate tendency of affecting wider trends in the Middle East. Whether it was the struggle between Iraqi and Iranian supporters in Beirut in late 1980 that presaged the Iran-Iraq war, or the appearance of Hezbollah on the Lebanese political scene in 1983-84 that heralded the dramatic rise of the jihadist movement in the Middle East long before bin Laden, the political fault lines of the region pass through Beirut. What of the Islamic Republic, striving to become the Middle East's hegemon? According to intelligence reports obtained by the Israeli military and Mossad, Iran doesn't want Hezbollah to start a major war against Israel at this time. Tehran prefers that the organization hold its forces in reserve in case they are needed by Iran to retaliate for an Israeli attack on its nuclear facilities. At the same time, however, Iran also has a clear interest in preserving Hezbollah as a central force in Lebanon. To the extent that Hezbollah's political clout might be weakened by the indictments, Iran—like Syria and Hezbollah—might support a low-key conflagration as a diversion. For its part, Israel has little interest in a war in Lebanon. It's central concern remains the Iranian nuclear project. However, by promising to respond strongly to any provocation, it might find itself forced to act aggressively. What's more, in the past two weeks, after a long period of relative calm, Hamas has repeatedly fired rockets at Israeli towns from the Gaza Strip and even from Sinai, which is Egyptian territory. Although there is no direct link between the incident on the Lebanese border and the rocket attacks in the south of the country, senior Israeli officials see them all as reflecting Iran's desire to prevent direct talks between Israel and the Palestinian Authority. Such Iranian involvement may increase Israel's resolve to respond to these attacks. Lebanon is a tinderbox. Whoever gave the command to the Lebanese snipers was playing with fire. Mr. Bergman, a senior military and political analyst for the Israeli daily Yedioth Ahronoth, is the author of "The Secret War With Iran" (Free Press, 2008).